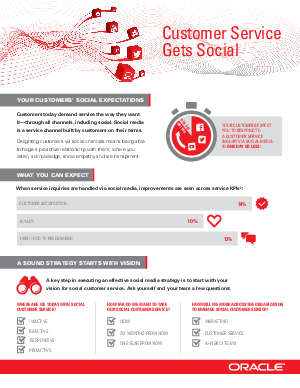 Customers today demand service the way they want it—through all channels, including social. Social media is a service channel built by customers on their terms. Delighting customers via social channels means being able to forge a proactive relationship with them, where you listen, acknowledge, show empathy and are transparent. To learn more download this Executive Brief. Compliments of Oracle.